December 2017 - Whiteboard Consulting Group Inc. This week on the podcast, which is our final episode of Season 2, we talk about things you should consider when you need to fire someone, either from their job or contract, from a project, or from, well, anything really. 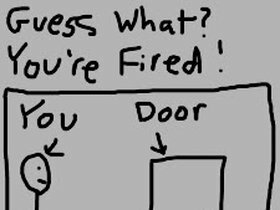 Please note that we are NOT HR professionals or lawyers, so in our podcast and in this blog, we are focused more on the emotional burden of firing someone vs. the legal and technical logistics. Often, organizations have people to help with this and make sure that no one gets in trouble or does something horribly wrong. There is definitely due process that is required, and if you find yourself needing to fire someone, you need to ensure you’ve reached out to the right people before you actually say the words. Have you given the person a chance to improve? If you’re firing someone because of poor performance, you need to be able to show that you’ve been clear with your expectations, you’ve had regular performance conversations, and you’ve actually given the person a chance to improve. Have you documented your conversations? Of course as part of a formal due process there are verbal warnings and written warnings and all kinds of documentation. We also recommend that you keep your own private and more casual notes on your discussions and important events. This can be used as evidence of your efforts to help the employee improve, your conversations, their reactions, etc. Have you planned what you’re going to say? Consider the ASBI tool so that you can open well, state the issue, and then BE QUIET. The temptation is to keep talking and fill the silence, and that just doesn’t help anyone (and could dig you into a hole). Be firm and kind. If you’re over emotional, you risk the conversation going sideways and losing control of what is happening. If you’re unemotional, you risk sounding like a cold hearted robot. If you’re firing someone because of a poor fit (vs. for poor performance), all the same preparation applies. Have you given them a fair chance to fit in? Have you chatted with them and coached them to allow them to adjust? Have you planned how you’re going to say what you need to say? Picking a mantra that is true, does not apologize, and does not admit to any mistakes, is critical. It allows you to repeat the message over and over as the person tries to process what’s going on. Remember, this conversation is not a debate. Follow up. It might be with the person or with HR or with a variety of other people. Ensure that the proper next steps have been taken – leaving it up to chance or process is a recipe for confusion and, if things don’t happen in the right way (for instance, owed pay is not issued), it makes a bad situation worse, and makes you look terrible. This may be the hardest of our Difficult Conversations – after all, we are talking about someone’s livlihood! Do your homework so you can get it as right as possible the very first time! Likely you will think back and wish you had done something differently. And that’s ok. This week on the podcast we tackle that one person in the office that makes everyone groan. No, not Peter with all his horrible Dad jokes. No, we gave Peter the week off. 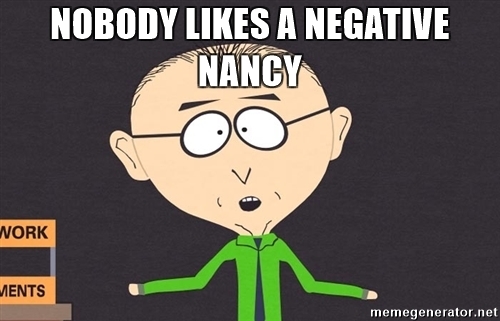 Instead we are talking about “No No Nancy”. She’s negative. She hates change. She’s a downer. She doesn’t like new things. She doesn’t even like old things. She definitely doesn’t like you. She says “No” a lot – and her behaviour is a drag. As always, our guiding principle here at Whiteboard is to seek to understand, so we should probably start with trying to uncover why some people have that negative style and others don’t. Is the negativity a result of personality preferences? According to Myers-Briggs theory, people with a preference for Sensing (S) typically need factual, real, observable data in order for them to consider it trustworthy information. Their personality opposites, those with a preference for Intuition (N), tend to trust information on the big picture and possibilities. When our big picture thinkers (N) bring ideas/concepts/changes to our fact folks (S), the latter typically respond with a barrage of questions. These questions, used simply to get more data, information, and facts, are commonly interpreted by N’s as REALLY NITPICKY AND NEGATIVE: What’s the cost per night? Whats the weather that time of year? What was the data from last year? etc etc. They aren’t meant to be negative, but that’s how they sound to their counterparts. As Ruth, Whiteboard’s resident S says, it’s “No for now, until you can prove otherwise”. Similarly – S’s might start off proposals for change and meet with a similar perception of negativity from their N counterparts: What’s the big picture? How does this link to the strategy? Have you thought of other ideas? etc. And the perception is the same – a negative response that is a huge drag. If you’ve identified your No No or Negative Nancy as someone who just needs more data, BRING MORE DATA. As I (Nicole) mentioned, I deal with my seemingly super nitpicky, annoying husband who loves facts, data, and observations (love you babe) by always bringing facts and data with my ideas about which I want him to make decisions. You know, like spreadsheets of vacation options with a zillion columns. If you are the data driven realist trying to appeal to a big picture seeking N, can you give some thought to strategy and future possibilities to accompany your data and appeal to their thinking style? This is all fine and dandy – but what if this isn’t a personality issue because there seems to be more going on? Is it possible Nancy’s No’s are the result of some past experiences that are triggering a negative behaviour response? Or said differently….. So this particular negativity comes from people who are impacted by past history/experience. Now the big question is how do we differentiate between the two sources of negativity, and more importantly does it matter? Let’s use Neville (Ruth’s Harry Potter obsession is really taking over…) as an example. Every time Neville hears about a project he rolls his eyes, mutters under his breath, and is just generally grumbly. Is he just being difficult because of past experience? Is he looking for the data? How can we find out? to “peel back the layers of the onion” and find out. I don’t see the research. Tell me about a time when this did work? This is an Appreciative Inquiry technique that helps people focus on the art of the possible. I’m tired of all this. This sounds like change fatigue, or previous examples of change that haven’t worked well or caused some workflow issues. In this case you might want to find out where the person is in their journey for change? Maybe set some expectations about your topic. But wait there’s more (like a great infomercial). I’m really mad about [insert unreasonable scenario that no one should be mad about here]. I can’t stand [insert really nice person who seems to just be driving Neville nuts]. Can you believe [insert really normal story that shouldn’t be alarming at all]. Sounds like maybe this is just a case of the MONDAYS. Sounds like this is just a grumpy day and will probably pass. Might be a good day to let someone just vent and be grouchy and not worry about this type of negativity bringing down the office culture too drastically. At the end of the day. Who’s on the “Bus to Change” with you? Who’s slashing the tires? Who’s grumpy in the back? And who’s gleefully singing songs at the front of the bus? The moral of this episode is….just because the symptoms sound the same (negativity), doesn’t mean the solution is the same. You have to investigate and find the source of the negativity in order to deal with it effectively. Listen to the podcast for Ruth’s Dog Bark/Tail analogy. Next week on the blog we fire Peter. Well not exactly – but we tell you what firing Peter might be like and how to prepare. And we give you a sneak peek on Season 3 of the podcast! So keep on listening.